Following the Freedom Trail of Captain James Knox, escaped from a Nazi Prison transport train outside Verona, September 12th 1943. It’s November 23rd. James has been on the run for just over 10 weeks. Now, he and his party of allied soldiers, who had escaped after the battle at the Morone Partisan base, above Largo D’Iseo, are now resting in a barn just outside Villa di Tirano. At 2 am they set off the climb for the last time, they hope. 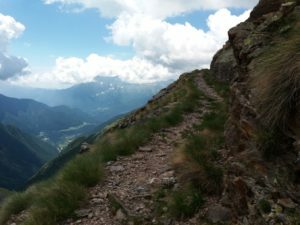 Following the sometimes narrow mountain trail on the Orobie Alps above the Vivione hut. After an uneventful climb, at just before 6 o’clock in the morning as they climbed the final hill, they see a red and white marker post silhouetted in the centre of a clearing on the hill top. It is dawn, just as they gain their Freedom! Below them, on the Swiss side they can see the village of Campo Cologne light up – no black out here! They continue to make their way down the Swiss side of the mountain. Arriving in the village they make themselves known at the Swiss Army border post. Like Douglas Clarke, before them, they receive a warm welcome. James describes them being fed Cheese Bread and Ovaltine in a manner that they had not experienced since capture! They are then transferred to St Moritz. From here James departs alone for the British Military HQ at Wil. Here he describes being given the luxury of a bath, a shave and clean clothes. They journey over, James and the others can now relax and enjoy the safety that internment in a neutral country brings. From then on, until September 1944, the 5,000+ British escapees have a fairly relaxed time in Switzerland. Some meet future brides. There are ski schools, rock climbing and other pastimes to keep everyone occupied. Finally, after the allied landings in the south of France (operation Dragoon, 15th August 1944), the allies reach the western border of Switzerland in September and the process of ferrying the POW’s home can begin. Rarely do I follow the story beyond the escape, but the question had been asked by some, following the story, so i decided to investigate further. In this war, as in all wars, so many people are lost. One might have thought that James had done enough. He had fought in Africa, been captured, endured life as a POW, escaped and lived to tell the tale. James was born in India, his father a now retired career Colonial soldier with the Indian Army. James had been commissioned into the 4th Sikhs Infantry Battalion and that is who he was fighting with in North Africa, when he was captured. At some point after his return to the UK he returned to his regiment, now re-badged the 4th/11th Battalion Sikh Regiment, to continue the fight (most likely as a volunteer, for not many POW’s were ‘returned to the line’). Ironic then that he should fall in March 1945, two months before the end of the war, in the same area of Italy from which he had originally escaped. He was aged 23 years. He lies buried in the Commonwealth War Graves Commission Graveyard at Bologna, Italy. From Jame’s debrief, courtesy of the Imperial War Museum archives in London, I would like to quote his words..
”My arrival in Switzerland was due very largely to the Italian’s of all classes who helped me, and whom I hope I shall never forget. I was fed by them, clothed by them and lodged by them and never betrayed, although at one time there was a reward of 8,000 Lira offered by the German’s and Fascists for information as to the whereabouts of any British Officer or other rank”. On the 8th September 2018, 75 years to the day, that Italy surrendered and the Allied Prisoners of War began their escape, i will be guiding a week long trek across the Orobie Alps to Switzerland, in memory of James, Douglas, their companions and all those others who passed this way. Profits from this trip will go to the Monte San Martino Trust, a charity that offers home stays and English language courses to the descendants and family of those Italians who sacrificed so much to help those on the run in WW2. There are 10 places on the trek and, if you are interested in learning more about the tour, before the web page is launched, please use the contact page to express your interest. Alpine Walks is a small independent company run by experienced mountaineer Duncan Boar. We offer adventure walking breaks for travellers wishing to visit the Mont Blanc region.